Hey RWYK family! We’re super happy to announce that Cub’s Wish by Angie Flores has been named a RWYK Certified Great Read. We are really excited about this announcement, we have been a fan of Angie’s Cub’s Wish for a long time. You may recall Angie was a guest on the show on March 10 this year. We also gave Cub’s Wish a very positive review back on May 3rd. We would like to republish that review here in celebration of Cub’s Wish joining our list of Certified great Reads. 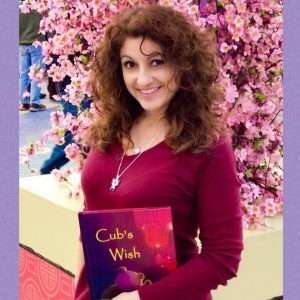 Congratulations to Angie Flores for winning RWYK Certified Great Read Status for Cub’s Wish! Making wishes for a wishing star is not always as easy as it seems, especially knowing the wish may be granted. Cub’s Wish brings out the sweet moments of conversation between parent and child and the understanding that sometimes we all need a little guidance to achieve our dreams. Born and raised in Hollywood, Angie was surrounded by California Dreamers. Following in the footsteps of her grandmother, who was also a writer, Angie was inspired to follow her dream through the concepts and questions her 3 young boys would present. After moving to the south bay and obtaining her degree in Child Psychology, Angie worked in various capacities, from teaching children with special needs, to mainstream corporate Human Resources. Angie is currently on the board of the Children’s Book Writers of Los Angeles as Marketing Director while assisting members in honing their craft and fine tuning their skills. With a love for pop culture and anything Harry Potter, Star Wars, Walking Dead, Tim Burton, and Disney related, Angie attends San Diego ComicCon and other similar events yearly with the dream of one day being on a panel and sharing her journey to inspire others to follow their dream. Travelling, rollerskating by the beach, and hanging out with her family is always at the top of her list. With an open heart and mind, Angie is continuing to live each day to its fullest. OMG, this was such a cute book! I love panda’s and can’t resist their cuteness and reading this book was not less than a wonderful treat for my eyes and soul. Not only is it freaking adorable, but it is one of those children’s books that teaches a very important lesson that sometimes we all need a little help and guidance to achieve our dreams. 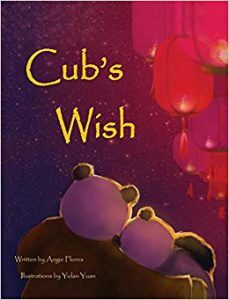 Cub’s Wish is a story about Papa Panda and cub going out for a walk to enjoy the night sky. They find a nice hill to sit and watch the stars. A dazzling star catches cub’s attention and he asks papa panda that why it is brighter than the rest of stars. Papa panda says it is a wishing star and if you make a wish and if the star feels that your wish is worth granting then its magical powers will make it come true. Cub is excited at the thought of his wish coming true but soon realizes that wishing on a star is so hard as he has everything he could ever ask for. He asks his father about his wish and papa panda says that he always wants to feel as happy as he is now. Cub asks his father if he can share his wish and focus on the star he wishes to be as happy as he is in this moment. Beautifully done!! Thank you, Angie Flores, for writing such a wonderful book and sharing this with me. I also cannot wait to share with my 5-year-old niece. The illustrations are extremely adorable and colorful. It captures the Beautiful Bond Between papa panda and his cub…hugging each other and watching the stars together. This book is a must-read for parents and young children as it showcases the parent and child relationship beautifully and can be a great addition to children’s bedtime routine! Again a big thank you to Angie for providing us a free copy of this book through Reading with your Kids certified program. The opinions expressed in this review are entirely our own. PreviouslyFiona Maria Simon discusses Gambling on Granola! Read NextJen Malone talks Changes in Latitudes & Best Night Ever!